Highlighting the GOP's underlying gender issues, conservatives on the Judiciary Committee have etched into the public record profiles in cowardice. Only four hours after Judge Brett Kavanaugh refused to call directly for an FBI investigation of the sexual-assault charges against him, Alabama’s first-term senator, Doug Jones, tweeted that he will vote against the Supreme Court nominee. Jones’ late-night announcement stood in quiet contrast to President Donald Trump’s thunderous endorsement of Kavanaugh and his defiance of Senate Judiciary Committee members like Sen. Amy Klobuchar, D-NM. The Kavanaugh nomination process has been flawed from the beginning and incomplete at the end. Dr. Ford was credible and courageous and I am concerned about the message our vote will be sending to our sons and daughters, as well as victims of sexual assault. I will be voting no. Jones, who stood up to savage conservative attack ads in his home state before announcing his decision last night, likely provides a straw in the wind, confirming polling trends that point toward Republicans losing their House majority on November 6. The GOP’s midterm fate feels ominous regardless of whether Kavanaugh is confirmed by the full Senate. The vote was originally scheduled for Oct. 2, but a late push by Arizona Sen. Jeff Flake to reopen the FBI investigation, which was accepted on Sept. 28 by the White House, will push the vote at least another week. Trump believes that Kavanaugh’s furious denunciation of the “search and destroy” tactics of Democratic committee members should offset the public-relations triumph of Dr. Christine Blasey Ford’s calm, scientifically detailed account of her traumatic memories. But a summer-long swell in feminist outrage across the polling universe argues that the bulldozer indifference to women’s concerns displayed by Trump, Senate Majority Leader Mitch McConnell and the Judiciary Committee’s bumbling chairman Chuck Grassley, R-Iowa, has probably assured the Democrats the seats they need to retake the House. Once in control, Democrats could even launch an impeachment movement. This is hardly a daring prediction. Amid a political landscape that has become paralyzed by partisanship, female voters are expected to play a pivotal role in the upcoming Congressional elections. And polling suggests a strong Democratic tide has been gaining force since Labor Day. The Pew Research poll released a few hours before the Kavanaugh hearings convened showed Democrats leading by 10 points in the generic Congressional vote, and a record 72 percent saying that Congressional control would be a factor in their vote. Among such voters, only about one in five said they planned to vote in support of Trump. Trump’s bluster will surely solidify his base of plus-or-minus four voters out of ten. But the GOP’s midterm odds felt slimmer and slimmer with every modest, convincing word spoken by Ford and every spectacular, self-stereotyping utterance from Kavanaugh. Jones’ defiance of the Trump machine in his very red home state probably presages the defection of other survival-minded Democrats like Sen. Joe Manchin of West Virginia. But the deciding votes may well be Sen. Susan Collins of Maine and Sen. Lisa Murkowski of Alaska, both Republicans, who have a chance to enter the feminist pantheon. Their votes represent the latest battle in what has been a long twilight struggle to end macho Republicanism. Jones’ case, though, provides a microcosmic view of this moment in national politics — and illustrates Trump’s shaky hold on public opinion. 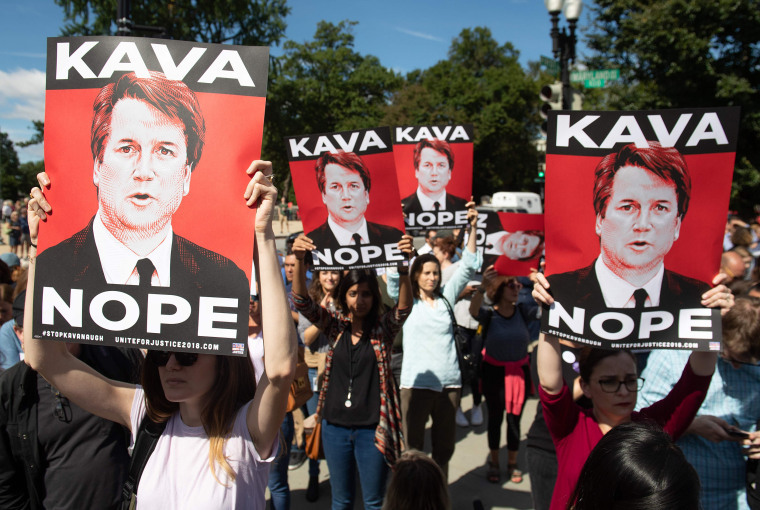 At mid-summer, 54 percent of Alabama voters wanted Judge Kavanaugh to be seated, according to an AL.com poll. Jones won his own Senate race by garnering a 30 percent share of the white vote, which was anchored by college-educated whites in general and suburban Republican women in particular. This same dynamic is reflected in many of the 30 or more highly competitive House districts now in play. One cloud on the Democrats’ horizon is that a Wall Street Journal/NBC poll shows Hispanic voters are not as engaged as women voters. Turnout, always a key factor in midterm elections, is uncertain. That is why Trump will embark on a crusade to combat voter apathy among his supporters throughout October. But his party still faces a head wind epitomized by the #MeToo sensibility. For example, a new Los Angeles Times poll showed a summer-long erosion among suburban women, who now favor Democratic congressional candidates by 61 percent to 35 percent. A dependable GOP support group, married white women, now favor Republicans by a narrow 51 percent to 46 percent. As the Times’ David Lauter wrote, “Those numbers help explain why suburban Congressional districts long held by Republicans — from Orange County and Santa Clarita to the suburbs of Dallas and Houston and east to suburban Philadelphia have become key targets in Democrats’ effort” to win the seats they need for a House majority. For the Republicans on the panel, the optics of the hearing were disastrous, politically and sociologically. Highlighting these underlying gender issues, the Republican majority on the Judiciary Committee have etched into the public record memorable profiles in cowardice. Even the dodge to hire a female “assistant” to question Ford backfired, as Arizona prosecutor Rachel Mitchell asked questions that only highlighted Ford’s aura of believability. For the Republicans on the panel, the optics of the hearing were disastrous, politically and sociologically. Kavanaugh’s fury played well with some commentators, but to others it made him seem like a preppy brat. In Senate and gubernatorial races nationally, the coalition that defeated accused Alabama child molester Roy Moore, which was composed of suburban women, minority voters and Republicans disenchanted with Trump, may push even further into the GOP’s Solid South. Democrats Stacey Abrams and Mike Espy have a real chance to emerge as, respectively, Georgia’s first female governor and Mississippi’s first black senator since Reconstruction. Howell Raines was executive editor of The New York Times from 2001-2003, editorial page editor from 19903-2001, and prior to that Washington editor, national political correspondent, and London bureau chief. Raines won the Pulitzer Prize for feature writing in 1993 for an article on coming of age in segregated Birmingham. He currently lives in Fairhope, Ala. in the winter and spends his summers in Henryville, Penn.